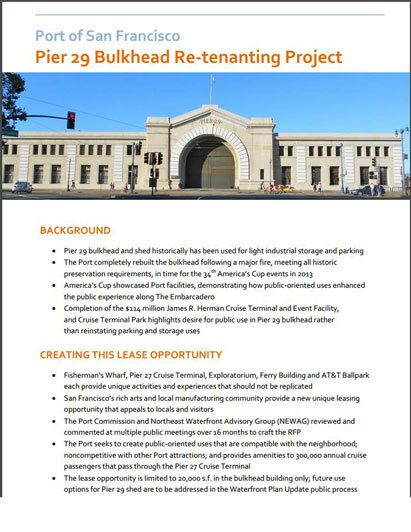 The Port of San Francisco is requesting proposals (RFP) from qualified respondents to propose potential uses for a lease to improve and operate a visitor-serving facility within a 20,000 square foot portion of the Pier 29 Bulkead Building, located in the Port's Northeast Waterfront adjacent to the James R. Herman Cruise Terminal. 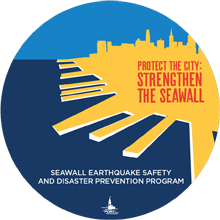 The proposed use must be consistent with the Port's Waterfront Land Use Plan which enumerates a variety of allowable uses at the Site, including retail uses. This RFP will specifically seek uses which focus on the creation and sales of arts, crafts and/or dry goods; including artists and designers working out of studio/exhibit spaces; innovators' open studios; galleries; public and other markets; and ongoing exhibitions, cultural and exhibit space including ancillary space for live demonstrations and displays. Some limited food service may be included. For a copy of the CAD file, please email Boris Delepine.